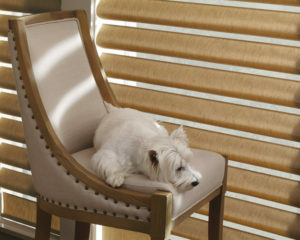 Pets add a layer of complication when it comes to selecting window treatments. After all, you keep their safety top of mind, and at the same time, you don’t want to have treatments that will be easy for them to damage. With that in mind, window treatments to avoid would be mini blinds, fabric shades, fabric verticals, draperies, and corded blinds or shades. As you search for the right solution, remember to select the product and fabric that meets your pet’s personality. No window covering is completely safe from chewing and scratching, but you can take precautions to minimize the hazards. Please visit or call Treasure Coast Window Fashions in West Palm Beach to learn more about all the products that are child- and pet-safe from Hunter Douglas Window Fashions. These shades offer a sleek, modern style with remarkably smooth operation, ease of lifting and the smallest light gap in the industry. They are available in hundreds of fabric choices, opacities, textures, and solids. Pets can sneak behind the shade without the threat of the shade falling down. Honeycomb shades cover the entire window, so dogs tend not to bother them. They are made from a very durable fabric and are available in hundreds of colors and opacities. Add the top-down/bottom-up feature with LiteRise® cordless system, and you have the best of all worlds: Lower the top, raise the bottom, or keep them in a combination of both. Both types of shutters are very durable and difficult for pets to maneuver open. Available in grain-like finishes, whites and off-white colors, and three slat sizes. They’re easy to clean—just dust with a cloth. With these blinds, you can tilt the slats open or closed, so light can enter and pets can see out. They are easy to clean. More durable than wood, but be aware that a large dog could still snap the slats. Treasure Coast Window Fashions provides more than just the finest window coverings. Our owners are involved in every project from start to finish to ensure your window covering project exceeds your expectations. We’re proud to serve the greater West Palm Beach area including Riviera Beach, Hutchinson Island, Okeechobee, FL. Please contact us at 772-220-8870 or visit our showroom in Stuart, FL, for more information about our products and services. Contact us to learn more.